Andong Kraloeung is a must-see eco-tourism site located in the remote hills of the Seima Protection Forest in Mondulkiri province. Unknown to most until recently, Andong Kraloeung is home to a unique collection of incredible plants and animals. And its beauty is now available for all of Cambodia — and the world — to see. Seen above is the globally threatened Hog Badger (Arctonyx collaris), captured in a rare camera trap photo. The USAID Supporting Forests and Biodiversity Project — through the good work of project partner, Wildlife Conservation Society — has assisted with developing a community-led ecotourism site that creates more options to protect their forest while providing cash income, employing young villagers and showing the world this incredible forest heritage. To learn more about the hog badger, click here. 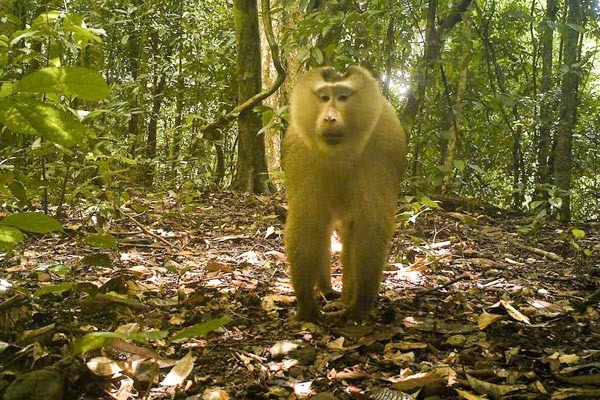 This camera trap photo shows a globally vulnerable Pig-tailed Macaque (Macaca leonina), recently identified in the Andong Kraloeung community forest.